A New Empire of Baijiu? Can China's misunderstood national spirit level up at home—and then go global? Baijiu, a cause of, and solution to, some of life's problems. 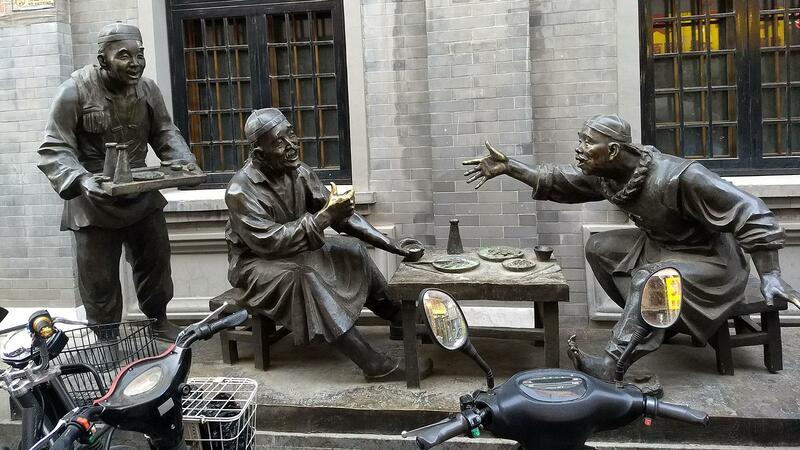 Diorama outside the Red Star Distillery in Beijing. Earlier this year, I made the 14-hour flight from New York to Beijing for the first time and figured it was time to revisit my acquaintance with baijiu (roughly pronounced "bye-joe"), China's traditional national spirit and the most-consumed liquor on the planet. I'd previously encountered this libation, which usually begins life as sorghum fermented in a mud pit, in 2013, at a spirits tasting of Asian curiosities with too many bottles and too few translators. Like many baijiu neophytes, I came away thinking that the brightly colored, fancifully shaped bottles showed best when sealed shut with their distilled contents safely inside. Five years is an epoch in epicurean trends, and baijiu has made halting progress stateside in that time. A few years back, the first baijiu bar in the U.S. opened in downtown Manhattan, then reopened in a new space this past April as the more ambitious Lumos Kitchen. A handful of distilleries and importers have been trialing new bottlings with English-language labels in North America, including ByeJoe, Dragon Mist, Confucius Wisdom, Vinn Distillery and Ming River. In today's climate, intrepid imbibers seek out barrel-aged grappa, gluten-free soju and Oaxacan mezcal ice cream. So Simon Dang, cofounder of Ming River baijiu, a new brand targeted at an international market, told me he felt the moment is right for his brand of floral-herbal-umami tipple. "I think now so many consumers are kind of looking for more unusual flavors, and so are bartenders," he said. But first I went to the source to try the old-school stuff: On my last day in Beijing, I stopped by the historic state-run Red Star distillery, now a modest museum whose gift shop is a liquor store, to find out more. The exhibition takes visitors through life-sized dioramas of bronze figures frozen in the stages of the baijiu process. There are the sorghum pits, the workers drawing from the still and finally the jolly carousers toasting "gānbēi!" There's also a display of Red Star paraphernalia: This is the spirit of the People, and Mao kept it flowing all night Oct. 1, 1949, to celebrate the birth of the People's Republic. Today, Red Star offers several dozen labels—bottled in green, blue and clear glass based on alcohol by volume (ranging from about 46 percent to 56 percent)—as well as some specialty cuvées in more ornate packaging. Red Star specializes in the northern Chinese "light aroma" style of baijiu, one of the drink's four primary categories based on aroma; rice, strong and sauce are the other three. Some bottlings tasted like the coarse pour I remembered; the woman at the shop counter laughed and shook her head when I asked if she drank baijiu. But other, newer versions showed more elegance, with elements of pine, resin, lilac and citrus fruit associated with the best examples of light-aroma baijiu. Meanwhile, the Ming River team had been experimenting with what sort of product they wanted to show. "We actually started out doing rice [aroma]," the most approachable, they thought, to palates unfamiliar with the spirit, Dang told me. "Then we started talking to bartenders, and they were like, 'This is nice, but in a cocktail, the flavor profile gets covered.'" The team decided that to better intrigue their bartender friends, they would introduce a more "representative" sorghum-based spirit with more pronounced tones of tropical fruit and anise, and began working with the centuries-old Luzhou Laojiao distillery in Szechuan province; they labeled their strong aroma bottling as "Szechuan baijiu." With that flourish, Westerners can place the baijiu as an ingredient of a particular culture and cuisine, which opens the door to another canny but organic way to sell it: as an essential part of a complete "authentic" Szechuan meal, at hot spots like New York's Kings Co. Imperial and General Deb's. Could Brooklyn-inflected Szechuan cuisine do for baijiu what white-tablecloth Italian did for Tuscan wine and New Southern for Bourbon, demanding a place at the table for quality versions of it? Giving it such context is certainly a better pitch than "Get a load of this weird provincial hooch." You can follow Ben O'Donnell on Twitter at twitter.com/BenODonn. I have been to Bejing several times for business and every time I have been there I have been "forced" to indulge. Just reading your blog invoked my gag reflex! I have brought some home and the reaction from family and friends has always been the same...yuck! I tell them it is an acquired taste!